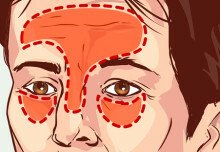 The sinuses are the hollow spaces behind the cheekbones, nose, and forehead. Normally, these spaces are empty, with the exception of a thin layer of mucus. 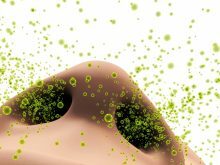 Sometimes if fluid becomes trapped inside the sinuses, bacteria or viruses can grow and cause the tissue lining the sinuses to swell up. This is known as a sinus infection, or sinusitis. Viruses cause most sinus infections, although some can be due to bacteria. A sinus infection produces many of the same symptoms as a cold?including a stuffed and runny nose, green or yellow nasal discharge, and headache. It can also cause pain in the face or teeth, coughing, fever, bad breath, and fatigue. Sinusitis can be acute, in which case symptoms come on quickly and last for three to eight weeks. When the condition lingers for more than eight weeks, or keeps returning, it?s known as chronic sinusitis. Not every sinus infection needs to be treated with antibiotics, but when bacteria are the cause the doctor may prescribe an antibiotic. A 10- to 14-day course of antibiotics usually clears up the infection. Over-the-counter cold and sinus remedies can relieve symptoms of a sinus infection. Nasal decongestants and antihistamines bring down swelling in the nasal passages to open up a clogged nose. Nasal steroid sprays also reduce swelling in the nose. For chronic sinusitis, your doctor might prescribe steroid pills to bring down inflammation. You can also try a few home remedies to ease symptoms. A saline nasal spray can help break up congestion. Inhaling steam from the shower or a vaporizer is another way to alleviate congestion. Warm compresses can help with sinus pain. To prevent future sinus infections, wash your hands with soap throughout the day. Keep up with all of your recommended vaccinations. And avoid close contact with anyone who is sick. Strep throat symptoms in adults usually mean a visit to a doctor is in order. The organism that causes strep throat symptoms in adults is highly contagious and can lead to a painful sinus infection as well. Bacteria are one-cell organisms that are everywhere. Literally. Most bacteria are harmless, and many are beneficial. We need “good” bacteria to digest our food and help arm our immune system. And “good” bacteria destroy “bad” bacteria that may ultimately cause a bacterial infection. Don’t sniff a the loss of sense of smell. Besides a connection to dementia, there are health and nutrition factors that make hyposmia (reduction), parosmia (distortion), or anosmia (complete loss) worth investigating. What’s the Difference Between a Sinus Headache and a Migraine Headache? When you start to feel a pain at the front of your head, down behind your eyes and nose, you may be developing a sinus headache. But you’ve had migraine headaches before and they feel similar. How can you tell them apart? Is there such thing as a sinus migraine? Anyone who’s ever had a sinus infection and felt the miserable pain it causes typically has one thought in mind: sinus pressure relief.